Mount Aconcagua is the tallest mountain in the world outside of Asia. At 6,962 meters (22,841 ft) it still does not come within the top 100 tallest mountains in the world!! All of these behemoths are located in the Himalayas, stretching from Pakistan to Nepal to China. Many people travel to Mendoza, Argentina, to go on mountaineering expeditions to summit Mt. Aconcagua (a journey that takes 18 to 20 days). 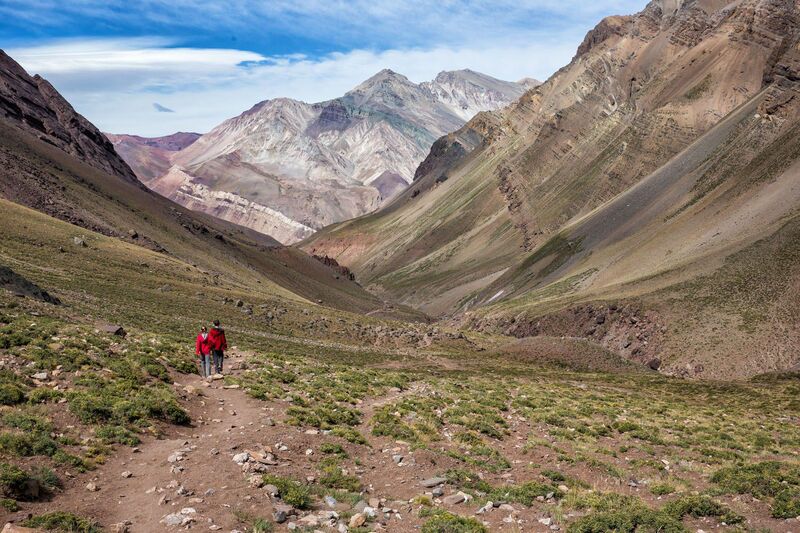 For those who do not want to go mountaineering, there are shorter treks available to go hiking in the Andes mountains in Argentina. 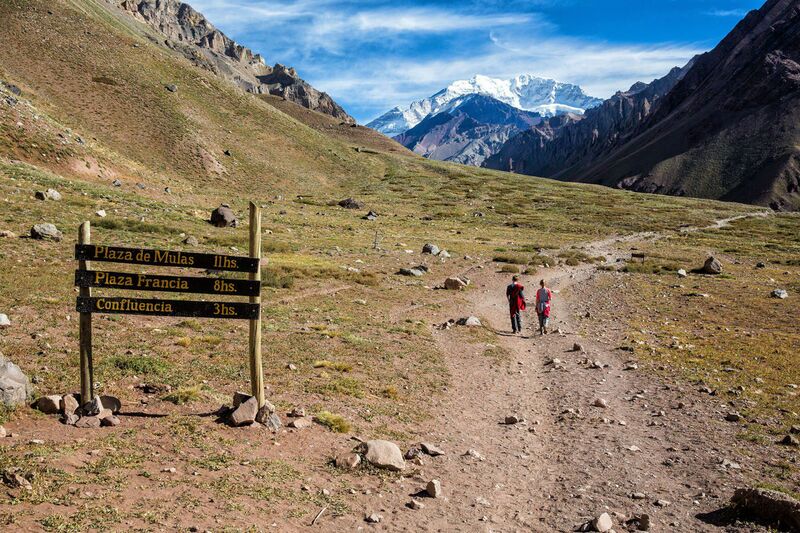 The shortest hike is the one day trek to Confluencia, the first Aconcagua base camp. For those with a little more time, there is a three day trek taking hikers to Plaza Francia and back. 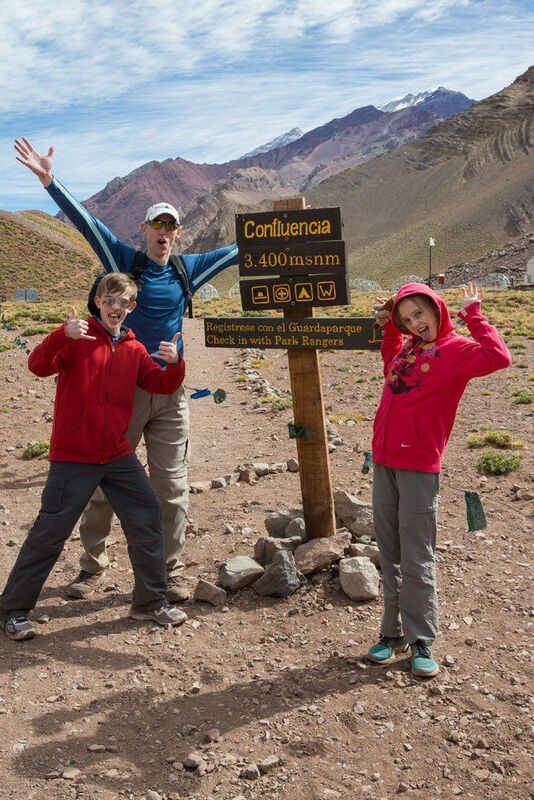 We did the trek to the first Aconcagua base camp, Confluencia. We had gorgeous weather, the scenery was incredible, and this became one of our favorite hikes yet. 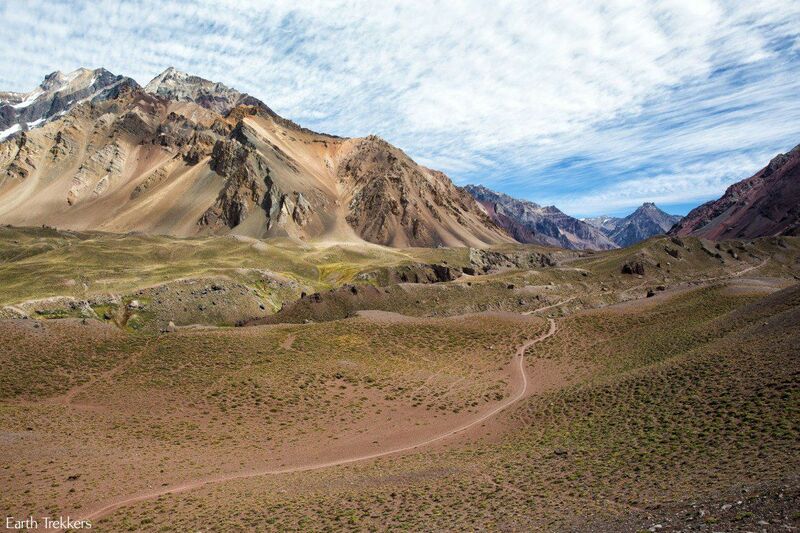 If you are traveling to Mendoza, Argentina and want to see some spectacular scenery in the Andes Mountains, put this hike on your list! To get here, you can rent a car and drive from Mendoza. The drive takes between two and a half to three hours. I recommend leaving Mendoza by 7 am to give yourself plenty of time for the drive and the hike. You can also get here using public transportation from Mendoza. There are three buses per day and the journey by bus takes four hours (one way). Click here to see the bus schedule. You know you are in the right place when you see this sign from the highway. There is a ticket office located at the entrance to the park. Make sure you have your passports because there is paperwork to be filled out in order to do the hike. Each person will need to purchase a permit. For the 2018/2019 season, it costs ARS 750 for a permit to hike round trip to Confluencia. 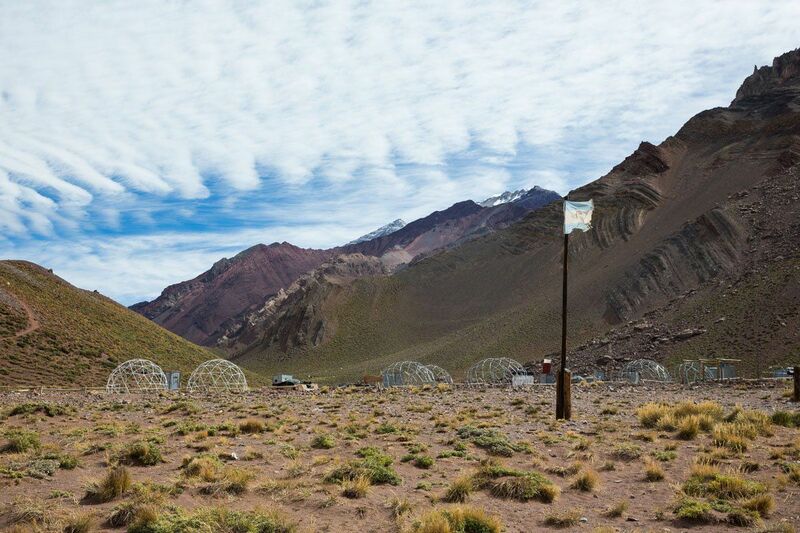 To read more about the permits, visit the official Aconcagua website. From the ticket office you will drive approximately 1 km into the park. There will be a parking lot for your car. From here it is easy to find the start of the hike. Mt Aconcagua will be looming in front of you in the not too far off distance. 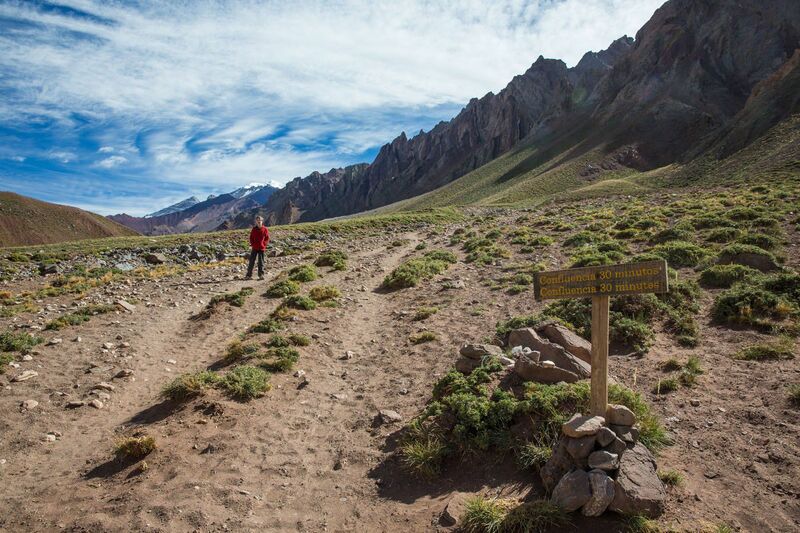 As long as you keep hiking towards Aconcagua you are going in the right direction. The hike starts at an elevation of 2,950 meters (9,678 ft). Confluencia is 8 km (5 miles) away and it is a mostly uphill hike. 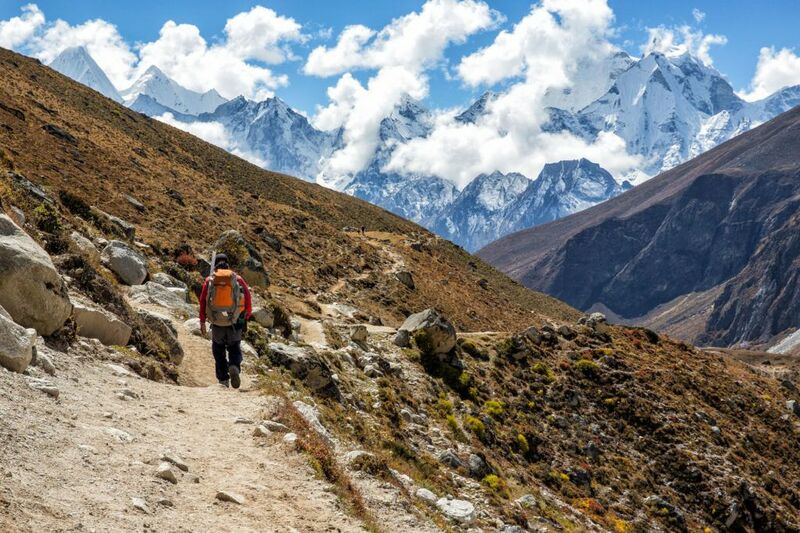 Since you will be hiking at a relatively high altitude, feeling breathless is normal. Once you start climbing you will really notice the effects of the altitude. Approximately 15 minutes into your hike you will come to this viewpoint of Aconcagua. At first, the trail takes you through a wide valley. There is a dirt road for 4×4 vehicles that you can hike along or follow the narrower single track trails. 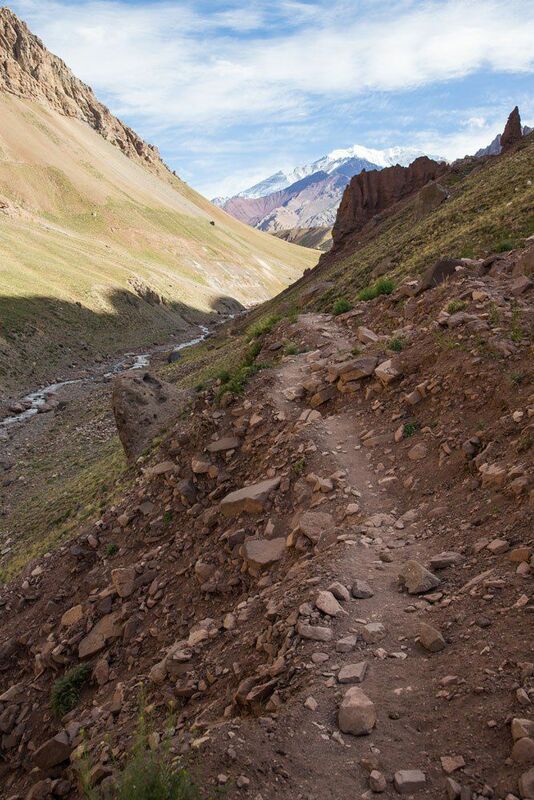 Just follow the valley towards Aconcagua. The trails are very easy to follow and it is almost impossible to get lost here. Once you cross the bridge the hike becomes more challenging. Soon you will be hiking on narrow paths along the valley and the real climbing will begin. It is a very safe hike but the only place where it was slightly dangerous was on the narrow trails above the river. This section does not last long. From here, keep climbing. The views just keep getting better. Not far from Confluencia there will be a short section (although it will feel very long at the time) where it is a steady climb uphill. It does not look challenging in the photos, but by now you are approaching 3400 meters (11,200 feet) so most likely you will really be out of breath. Things level out just before Confluencia. 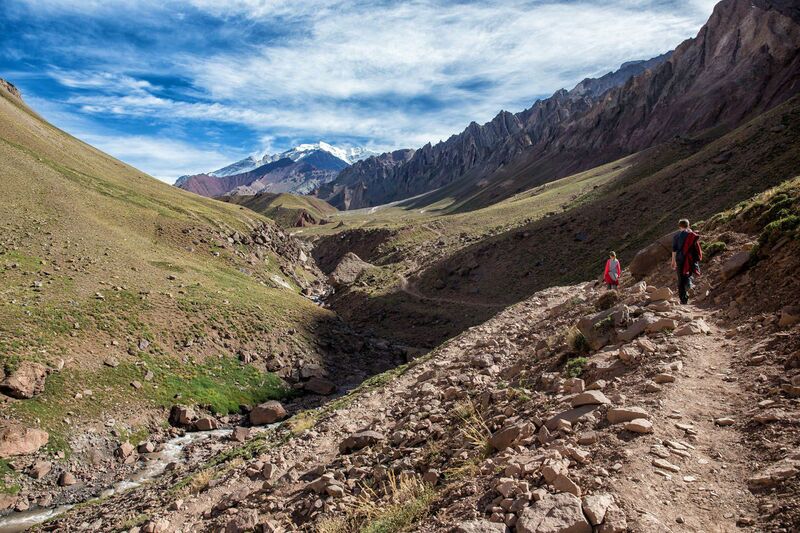 Just around the bend is Confluencia, the first Aconcagua base camp. We did the hike at the beginning of April. During this time, the climbing season is over and there are very few people on the trail. Confluencia was deserted with just a few buildings and vacant structures sitting idle, awaiting the next trekking season. It was chilly and very windy here. We felt very warm while hiking but once we stopped it did not take long to get cold. There is a small hill here, located just north of the base camp, that is worth climbing for some of the best views in the area. Just behind Tyler (in the photo below) you can see the continuation of the trail. 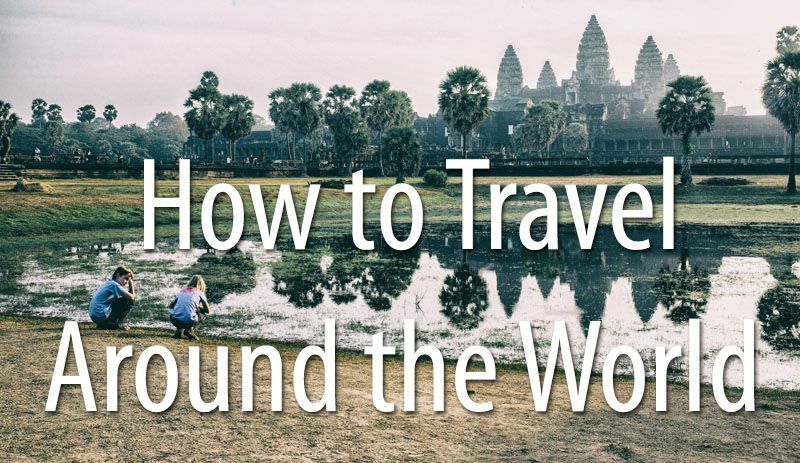 This takes you to Plaza Francia and beyond. We would have gone farther but we had a border crossing to do (but that is another story!). It took our family just under 2 hours to reach Confluencia. It would take us an hour and a half to get back to our car. The views were just as good, if not better, heading away from Confluencia. During the three and a half hours of hiking we saw only three other people on the trail and two of them were park rangers. This hike is one of the most scenic we have ever done. What’s even better is that it is very short, so you get a lot of amazing views in a short period of time. 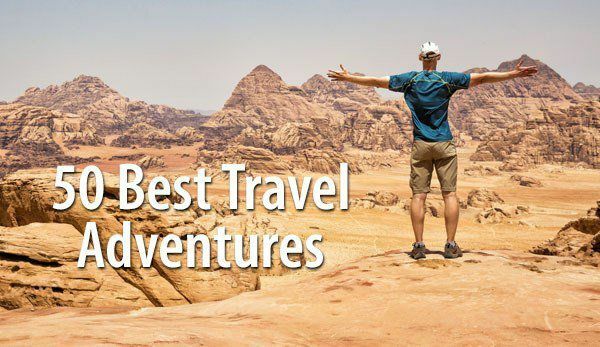 Now we may need to revise our 10 best day hikes in the world post! It is a 16 km (10 mile) round trip hike. There are 440 meters of climbing. The park ranger recommended 6 hours total for the hike: 3 hours to Confluencia, 1 hour to explore base camp, and 2 hours back to the parking lot. We spent 4 hours total hiking, including the time for the viewpoint over Confluencia, but we are fast hikers, even with kids. You need a reasonable level of fitness since you will be hiking at a relatively high elevation. Difficulty level for this hike is listed as medium. 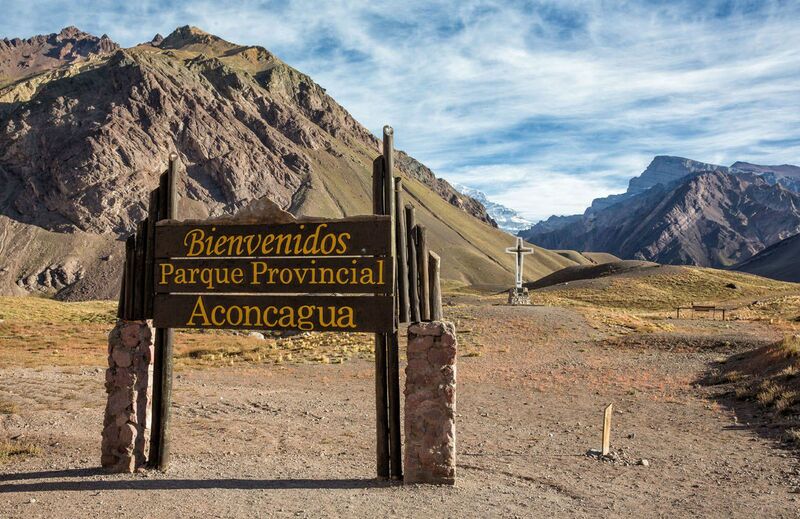 The entrance to the park, named Parque Provincial Aconcagua, lies just 15 km east of the Chile Argentina border on Route 7. The entrance to the park is located between the border with Chile and Puente del Inca, the location of the border crossing station (aduana) at Horcones. If you are traveling west on Route 7, the entrance into Parque Provincial Aconcagua will be on your right just past the border crossing station. You will not need to enter the border crossing station. This is only for those travelers who are coming from Chile and crossing over into Argentina. 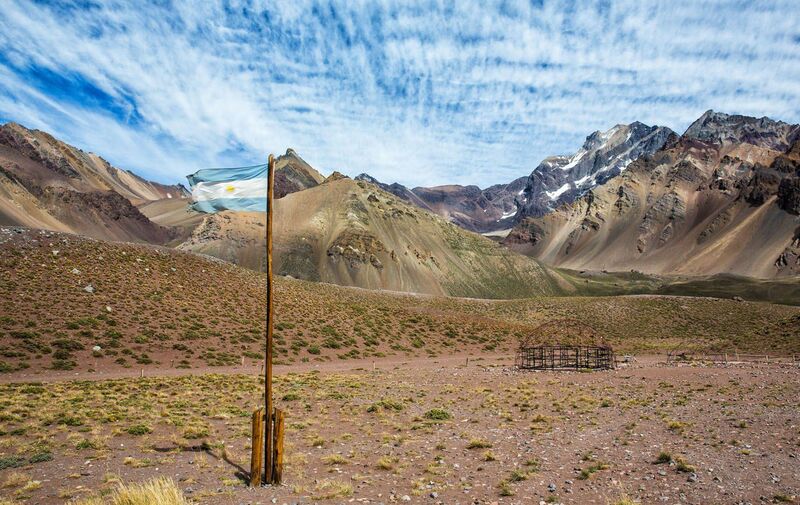 Most people base themselves in Mendoza, Argentina which is 193 km away or two and a half hours of driving. 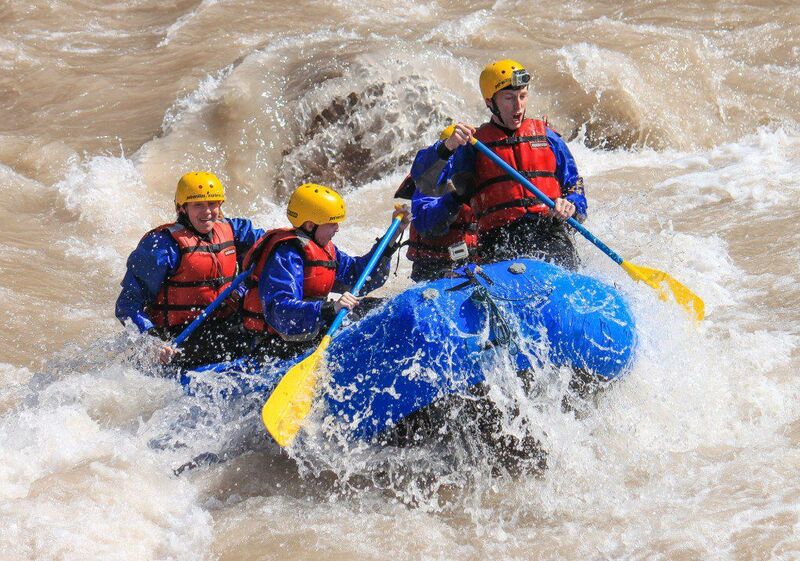 It seems like a long way to go, and it is, but this can easily be done as a day trip from Mendoza. There are closer towns to base yourself in Argentina, such as Potrerillos and Uspallata if you want to cut your driving time. 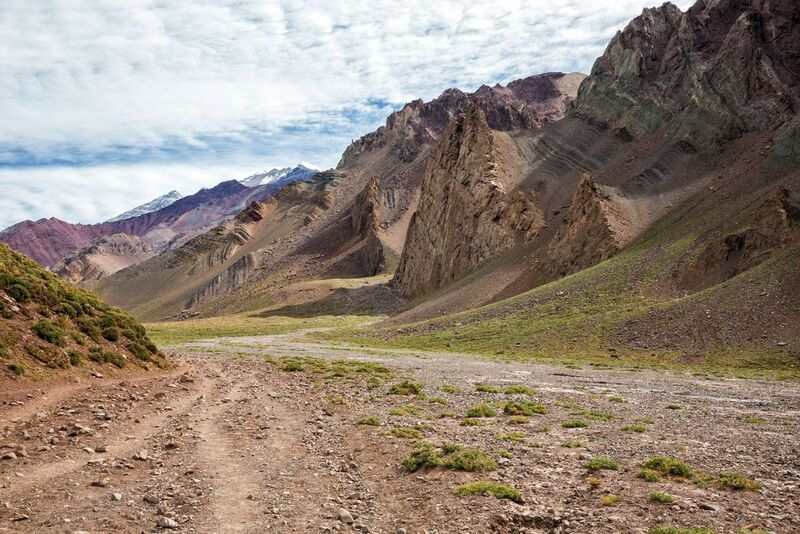 You will need a car to reach Aconcagua on your own. 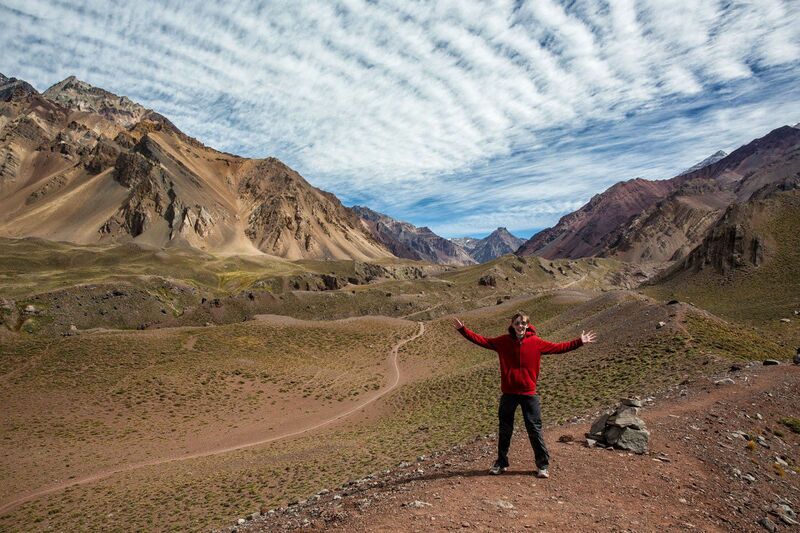 The drive through the Argentinian Andes is stunning and well worth it. We stayed at the El Encuentro en Chacras de Coria in Mendoza, Argentina. 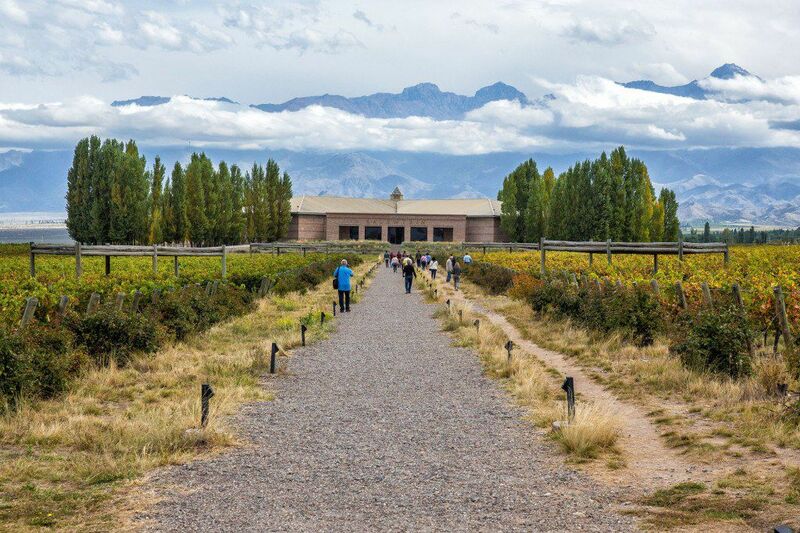 This small hotel was located in a nice area of Mendoza called Chacras de Coria, within walking distance of great restaurants and wineries in Maipu Valley. You will need your passport and Argentinian pesos to purchase your permit at the ticket office. Bring sunscreen, lots of water, and snacks. Wear hiking shoes or trail shoes. 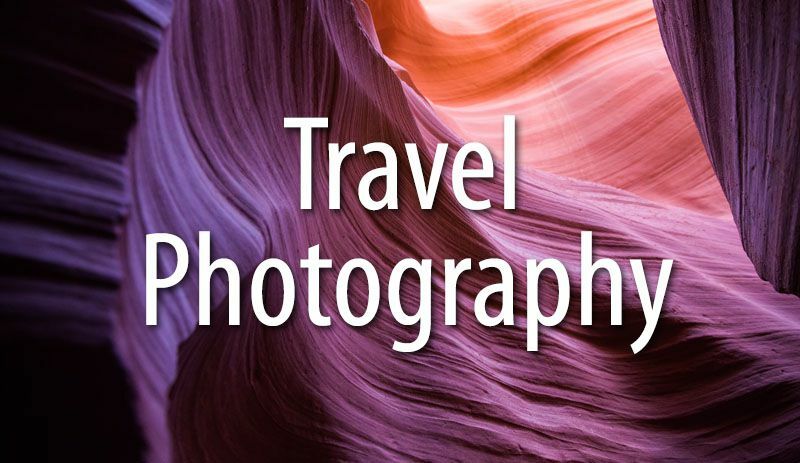 And don’t forget your camera! 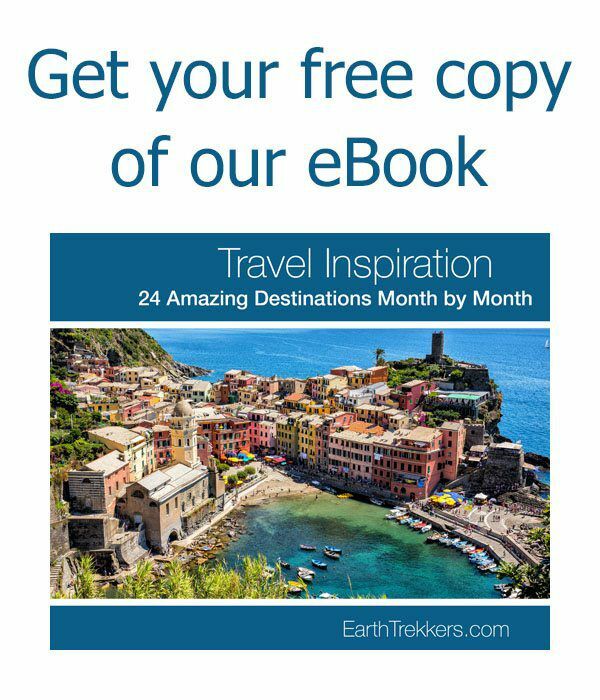 Do I need a guide to hike to Confluencia? A guide is not mandatory to hike to Confluencia. If you have prior hiking experience and can follow the trail, there is no need to hire a guide. The trail is easy to follow and there are no dangerous sections. But if you are new to hiking or do not feel confident being on your own, it would be wise to hire a guide. For a reputable trekking and mountaineering company, we recommend Andes Vertical. 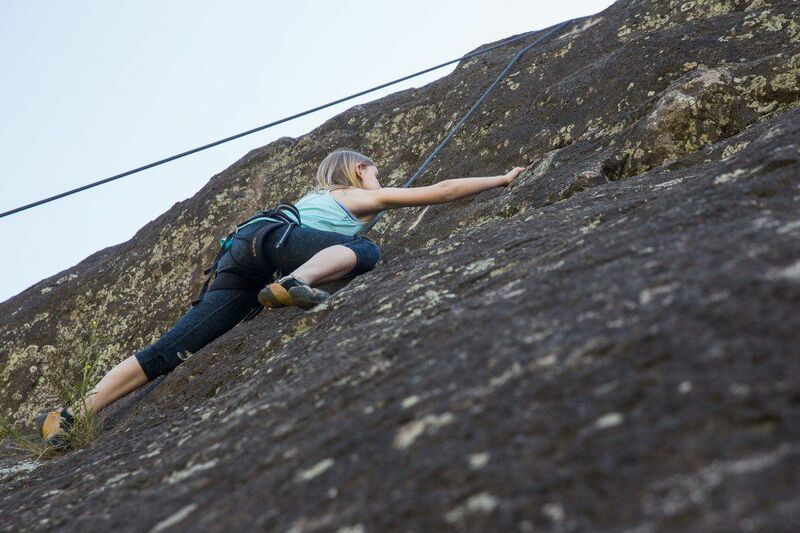 The official climbing season is November 1 to April 30, summertime in Argentina. For those hiking on the trails, the season extends past these dates. We hiked to Confluencia at the very beginning of April. For us, weather conditions were perfect. We had sunny skies and temperatures were approximately 18°C (65°F). This is low season, so there were only a few hikers on the trail. During high season, the peak of summer, expect to see many trekkers, horses, and larger crowds on the trails. For those short on time or for those who have no desire to hike to Confluencia, there is a much shorter option. In an hour or less you can hike to the first viewpoint and back. 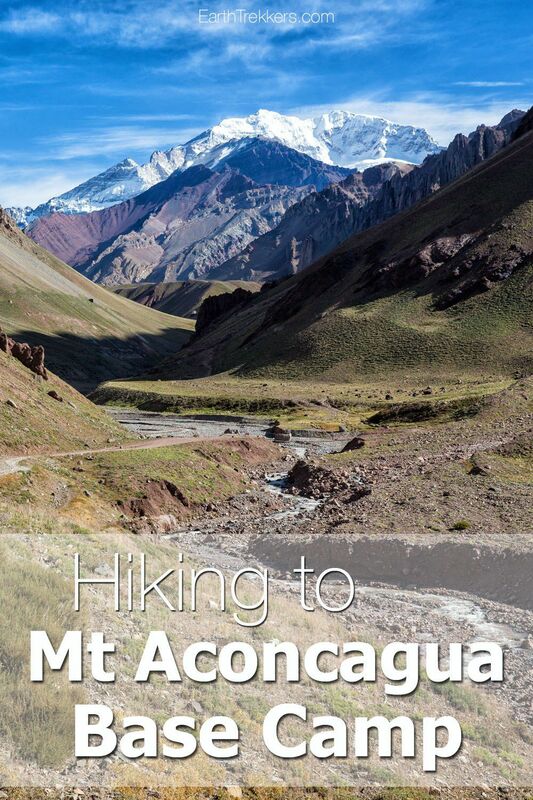 It is an short, easy hike with an awesome view of Aconcagua. For those driving between Chile and Argentina, this is an easy way to get one of the best views of Aconcagua. Most people see it from the highway but it is worth it to come here to get unobstructed views. 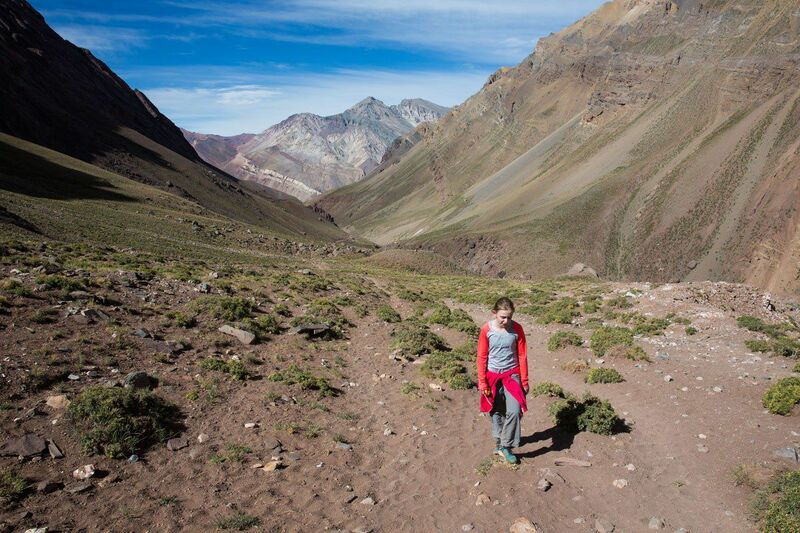 Called the “Laguna de Horcones Circuit” on the Aconcagua website, it costs ARS 200 for foreigners over the age of 13. Trekking companies offer multi-day trips to Plaza Francia, the reward being a close up look at the Aconcagua South Face. 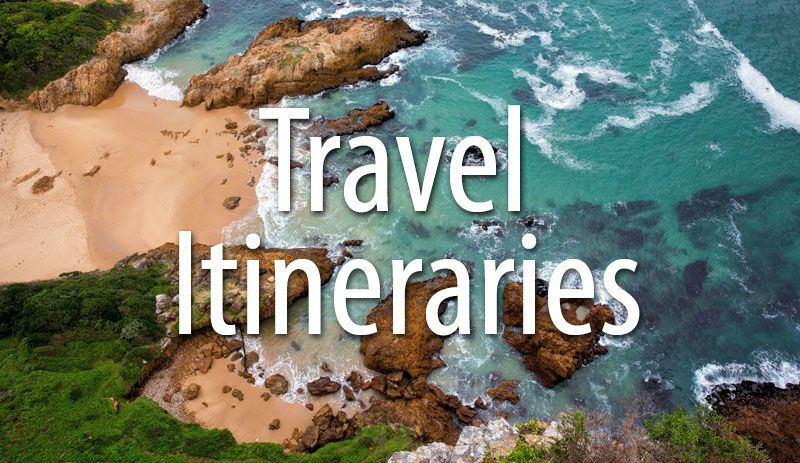 This trip requires three days of your time. On day one you hike to Confluencia, camping here overnight. On day two you hike to Plaza Francia and then back to Confluencia. On day three, you hike back to the entrance of the park. 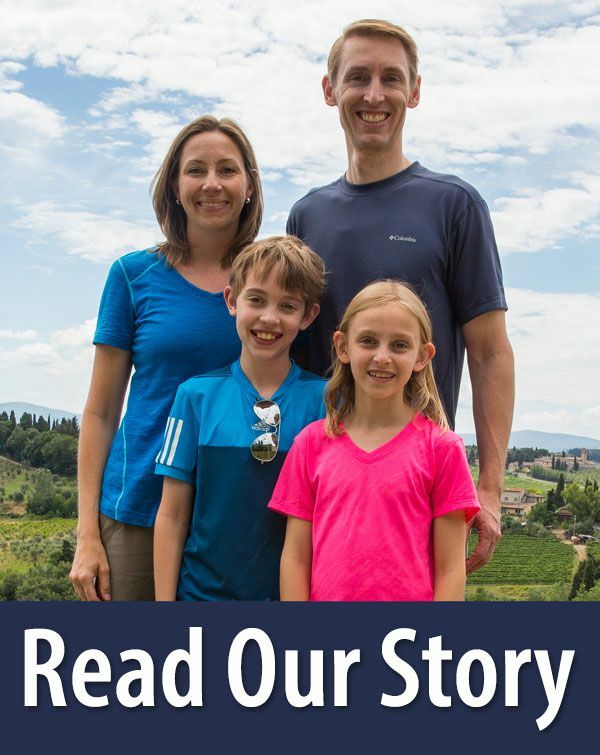 We hiked with our two kids who were 13 and 11 at the time. They had no problems on this hike. Active, adventurous kids at least 8 years old should be able to handle this hike. There are restrictions on minors hiking past Confluencia without a guide. 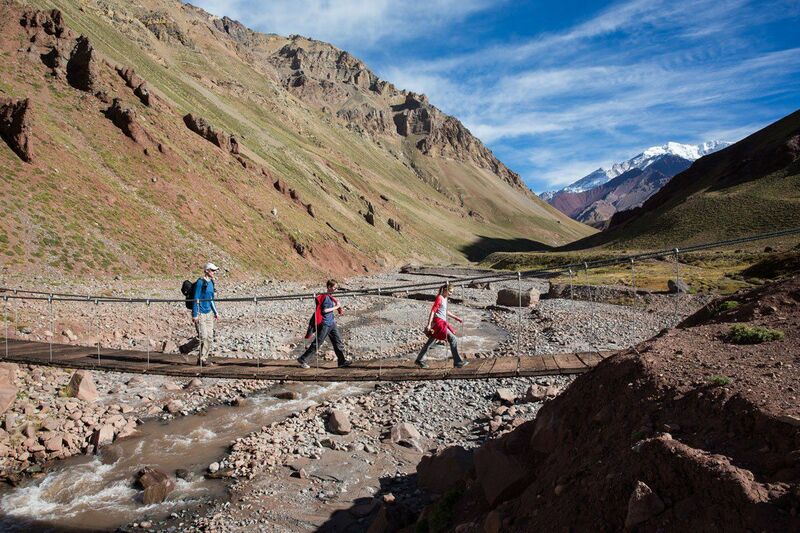 For more information, visit the official Aconcagua website. We based ourselves in Mendoza, Argentina but had to get back to Santiago, Chile for our flight home. Since we would be driving right past Aconcagua we decided to do the hike on this day, even though it would make for a very long day. We left Mendoza at 7 am, arrived at Parque Provincial Aconcagua at 9:30 am, and by 10 am we were hiking towards Confluencia. Once finished the hike, we resumed our drive across the border to Santiago. Of course, things couldn’t be that easy. We sat through a border crossing of epic proportions, taking us five and a half hours to get processed through customs and immigrations in Chile. It was totally frustrating but not at all unheard of here. If you have more questions, leave them below in our comment section. 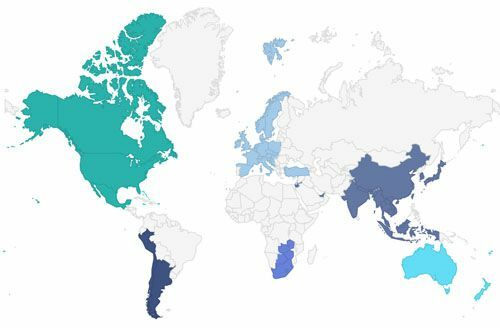 Going to Argentina or Chile? Read all of our posts on our Argentina Destination Page and Chile Destination Page. I have been to 18,000 and 19,000 ft a few times. And done high altitude trailracesmof 50 miles in a day more than a dozen times. Here is how to altitude adjust, I have to do it now, in my late 60’s. COLORADO! drive up to a high pass (Berthoud, Rabbit Ears, Independance near Aspen…and just sit and read a magazine for a few hours….tou will adjust a thousand or 2,000. Get out and walk…sleep much lower….repeat with hiking up high next day. In Utah, hike to top of Snowbird, hang out at the restaurant the rest of the day…but the day before, take the tram up and hang out to adjust. In Southern California, take the tram to the top of the moutain in Palm Springs, than hike to top and back to tram…do it in the Summer, the altitude will be closemto that high, the hiking difficuty sounds the same as description above. 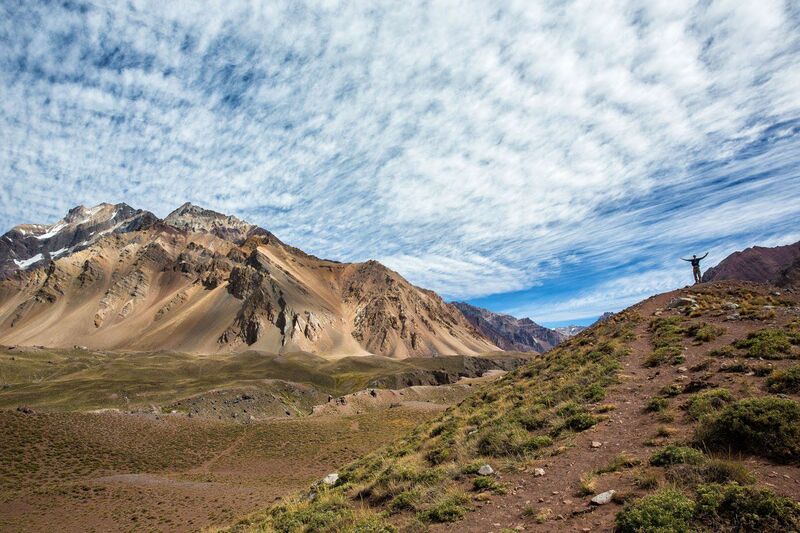 I will be hiking this hike in Argentina next January to familiarize myself for a summit trek in 2021. This is a marvelous well-signed trek in good weather. We did it in late March and while the skies in Mendoza were very overcast, as the bus drove up through the foothills the skies above the clouds were beautifully blue. My biggest mistake was not using sunscreen. Although the weather was warm, not hot, the altitude in a clear sky can create a serious sunburn, as happened to me. I see no reason for a guide on these well-marked trails. Hi, there! We are going to Argentina in December of this year and so starting the planning now. 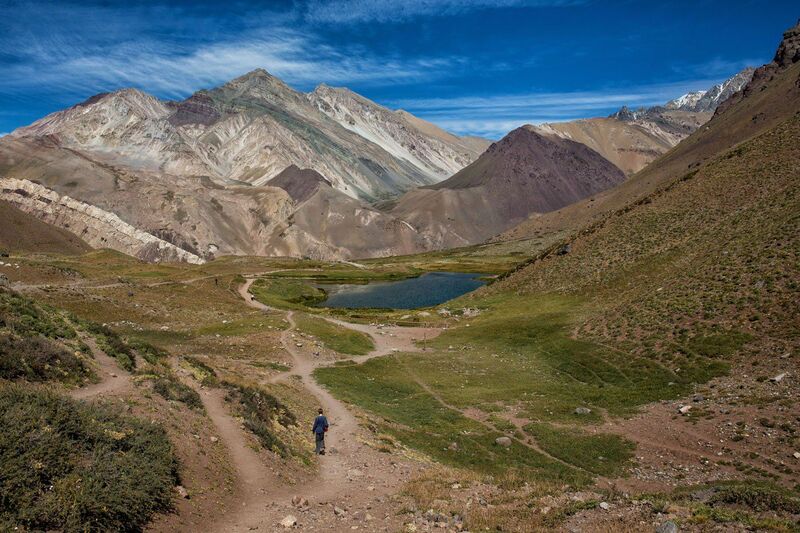 Strongly considering going to Mendoza, and this hike appears perfect for my husband and me. We are not hikers at all…but being in those mountains is a once in a lifetime experience. How would you rate the hike that you did? Beginner, Moderate? We are from VA and did Old Rag Mountain (complete with rock scramble area) and that really nearly killed us lol. But we are willing to prepare/workout to meet the challenges of this hike if needed. Hi Julie, one question: is it possible to get water somewhere on the track during the 3 hiking days? Otherwise I see it challenging to carry water for 3 days – which is around 10 liters. The tent has also to be our own, right? it’s not possible to sleep in the tents that are in the camp, unless you book a tour, correct? Great article , this was really helpful as we’re tackling the hike next week. 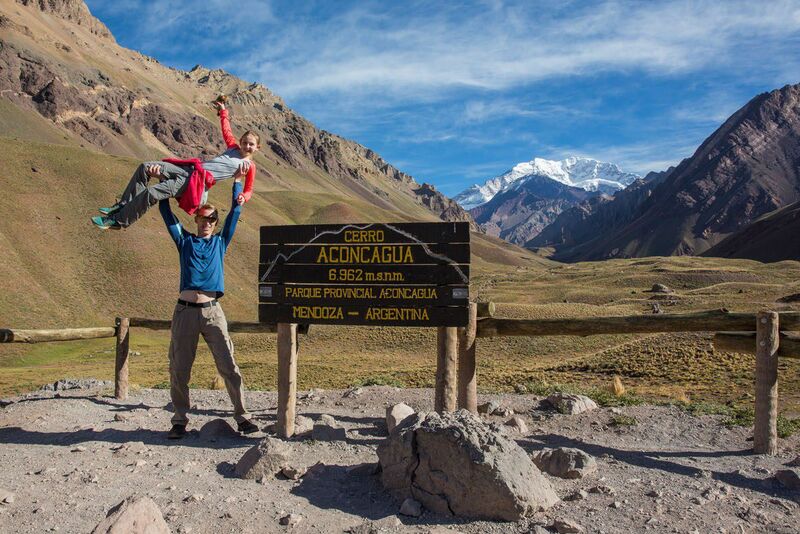 Just one quick question – how exactly did you reach Aconcagua from Mendoza? Did you drive yourselves? Or do you know if there are buses/coaches available? Just wondering: Are you related to a Wedgwood who climbed Tolosa in 1906 with a Swiss guide named Kaufmann? I just came back from the park. I did the 5-day trek to Plaza de Mulas with a trekking company. I did it with the basic package (no mules, public transportation from Mendoza to Penitentes village located a few kilometers from the park entrance, hostel at Penitentes). Your description is exactly what I found there: fantastic landscape, excellent weather and an easy-to-follow trail to the camps at Confluencia, Plaza Francia and Plaza de Mulas. I did it with a backpack carrying my personal belongings (clothing, sleeping bag, etc.) so my trekking times were longer: About 3:30 hours to Confluencia and 1:45 back to the entrance. For those who ask, as of January 2018, there are 3 daily buses from/to Mendoza to/from Las Cuevas near the border. The driver can drop you off at the park entrance.The bus company is A. Buttini. Their website is confusing and don’t have the schedules. Tickets are sold at the bus terminal or at “Terminal del Centro” in downtown Mendoza. Outside Mendoza and Uspallata, you can buy tickets directly from the driver (I did it on my way back to Mendoza). Hi Julie! Great experience and beautiful pictures! Me and a friend of mine we’ll be in Mendza the first week of March. We’re going to do the Plaza Francia trekking, but we’re trying to have a low cost trip. Do you know if is there any publuc transport from Mendiza to the Aconcagua Park? And do you kow if there is the possibility to sleep in the tent of Confluencia camp just paying the night-stay without buying the all tour with the trekking company? We are good tekkers andI don’t think we need the guide to reach confluencia camp and plaza francia! Thank you! what you describe with basecamp is basically just a stop-over to the “real” basecamp in a mountain climbers view. 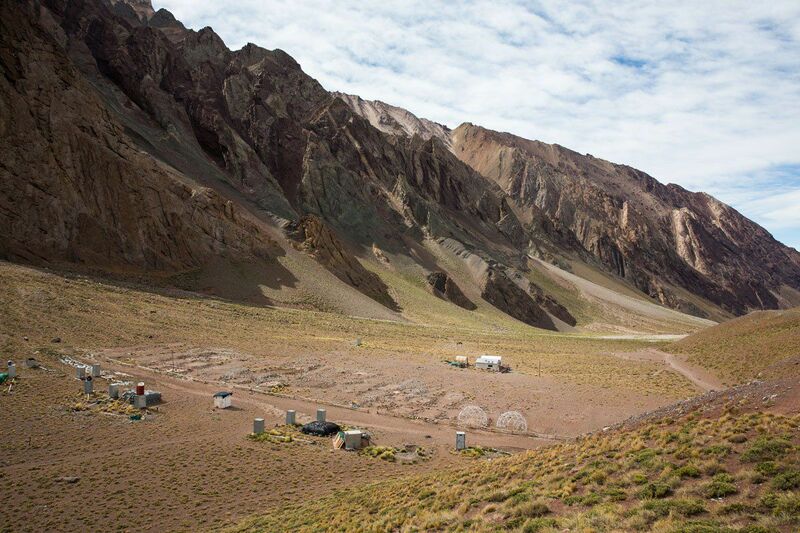 There are three basecamps at Aconcagua: Plaza de Mulas and Plaza Francia (via Confluencia) and Plaza Argentina (via a second valley east of Puente del Inca). Climbing Aconcagua is not to be underestimated. 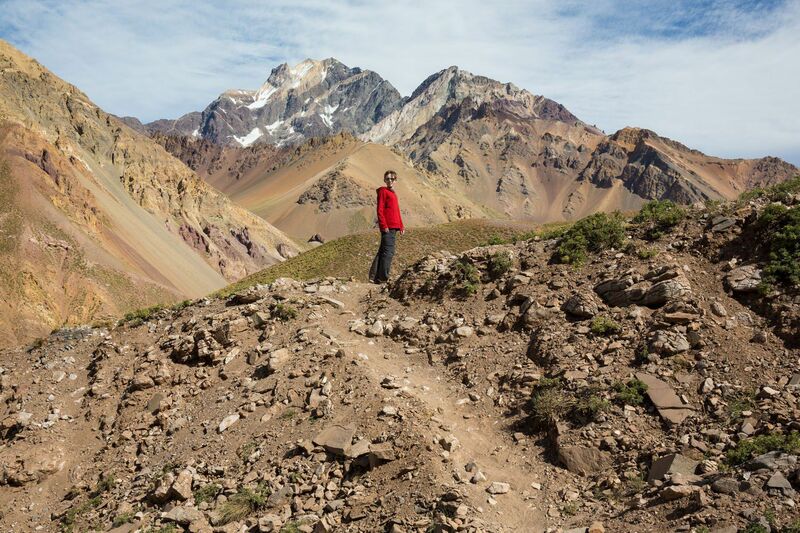 Even though tour companies offer it as “hiking in altitude”, it is more. The physical constraints above 6000 meters are serious. There is no fast “rescue service” above 5600 meters, as the helicopter available has this limit. Therefore acclimatization is a key point. This is why the expedition is in average 15 days. Winds on top easily reach 100 kilometers per hour and temperatures on the summit are never above -15°C without windchill-factor. Including this factor you have temperatures down to -35°C in which you have to “hike” around 14 hours on summit day. 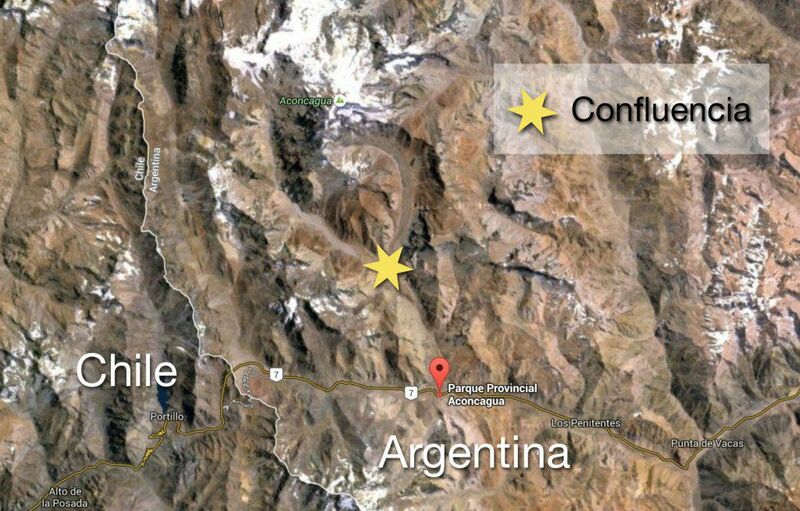 If you go by price Aconcagua summit starts at 3500 USD + 700 USD of the permit. Kili should be much cheaper!